Cabernet Sauvignon is often referred to as the “king of wines.” It is probably the most recognized wine varietal in the world and it is grown in nearly every major wine producing country in the world. It excels in Bordeaux France where it is often blended with Merlot and Cabernet Franc and also Napa Valley California where the varietal commands the highest price of any other varietal. It is also widely planted in grape growing regions in Australia and Chile just to name a few and has a wide-range of price points. Cabernet Sauvignon tends to be full-bodied, high in tannins and prominent acidity. Noticeable flavors include black currant, coffee, cigar smoke and dark chocolate. The best and well-built Cabernet Sauvignons will often benefit from time in the bottle as tannins and acidity will often fade and give way to new secondary flavors. 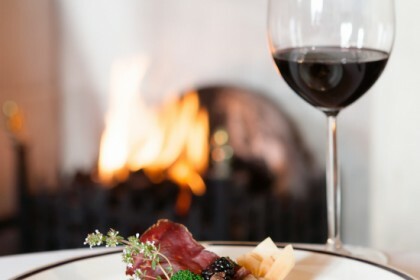 When pairing Cabernet Sauvignon with food, the obvious answer is to pair the wine with rare, red meat. But many chefs will disagree saying that the wine can actually over power the meat. That may be true in some cases, but there are Cabernets that are young that can pair with certain meats and proteins and there are Cabernets with some age on them that have a different profile that pair perfectly with more suitable meats and proteins. Let’s take a look. Cabernet Sauvignon that is young can be big, bold and very tannic depending on how it was produced. Food needs to be saltier, fattier and possibly sweeter to go with younger Cabernets. A meat that is fattier can cut through a young and tannic wine, softening both. Think of meat dishes like braised belly of pork and a cranberry-crusted lamb shoulder. Consider using sherry vinegar as part of the cooking process when serving a young Cabernet. This allows the fruit and tannins of the wine to blend perfectly with the red meat. Sweeter pasta sauces like a brown sauce that is made with mushrooms and caramelized onions or a Bolognese sauce can also level out the tannins and acidity found in young Cabernets. Aged cheeses like cheddar and certain nuts like walnuts can also be a perfect match for the tobacco and cassis flavors found in Cabernet. Not all wines get better with age including Cabernet, but the well-made Cabernets will take on new flavors that allow even more food pairings than younger wines. Filet mignon is a lean cut of meat that sometimes can get lost when paired with a young tannic wine. However, when the tannins have dissipated from an aged Cabernet, the lean filet works extremely well with the secondary flavors produced from the aging process without the high level of acidity too. Certain fruits and vegetables on their own or as part of a sauce also works with aged Cabernet. Think of black cherries, plums, tomatoes and roasted Brussels sprouts as terrific wine pairings. Although Cabernet is often frowned on to pair with chocolate dessert in favor rather of a sweeter dessert wine, bittersweet chocolate and sauces that are composed of dark berries can be a great finish to a meal, if, of course, there is any Cabernet left for dessert.